Back when I was just starting to explore the world of beer, Shiner was my go-to brand when I wasn't in the mood for Guinness. Local, cheap, and available everywhere with a relatively wide portfolio of un-challenging beers, it was the perfect gateway brand. After sampling the whole lineup, a strange new Shiner brew showed up on the shelves one day: Shiner 97. I picked it up at first sight, excited as all hell to try a new Shiner, and fell in love at first sip. Compared to what I had been drinking, the brew was full of depth and character. It was a Schwarzbier, also known as Black Lager, and the second beer in a series of five yearly beers counting down to Shiner's 100th anniversary. I bought a hell of a lot of Shiner 97 when it was out, and mourned deeply when it disappeared from the shelves. I eagerly picked up every single Shiner anniversary brew after 97, but none of them really lived up to the first. Though it's not a style to meant to be aged, I still have a small stash of 97, and every now and then I chill a bottle down. I have to say, it's holding up remarkably well, and really takes me back to those few months when Shiner 97 was my constant companion. 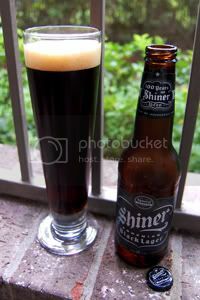 To my great surprise and excitement, Shiner "re-released" Shiner 97 as Shiner Black Lager a while back. It's available year-round and sports a significant marketing presence all around Houston. I guess I wasn't the only one who fell in love with the first incarnation. Shiner claim it's the same beer as before, and I might be crazy (or just in possession of a more experienced palate), but it just doesn't seem the same to me. Appearance: A murky, dark brown body capped by a thin, tan head that burns out quickly and leaves no lacing. Aroma: Roasty and bitter malt with mild chocolate and coffee notes. Taste: Much the same in the flavor profile. Roasted malt with chocolate, coffee, and nut-like character makes up the bulk of it with not much in the way of hops. The aftertaste is roasty and nutty. Mouthfeel: A thinnish body with sharp carbonation; rather unsatisfying. Drinkability: Drinkable enough, but you'll get bored before you get full. Verdict: I remember Shiner 97 when it was fresh having quite a bit more character and depth than this, but that might be because my palate wasn't quite as advanced as it is now. As it stands, Bohemian Black Lager is an inoffensive, but generally unexciting brew.